Preston lost ground in the race for the play-off places as Nottingham Forest earned a deserved point at Deepdale. Britt Assombalonga raced on to Zach Clough's pass to put Forest in front with his 10th goal of the season. North End keeper Chris Maxwell then denied Ben Brereton when one-on-one after a superb run from his own half. But Aidan McGeady levelled soon after the break, placing a shot into the bottom corner after he was teed up by Callum Robinson. Preston, who have won only once in five league games, started brightly with Paul Gallagher's shot deflected over, and keeper Jordan Smith saving from the in-form Tom Barkhuizen. The visitors arrived at Deepdale with just 10 points and two wins on the road all season, but gradually got on top and deservedly led at the break. The Lilywhites, who are unbeaten at home since Boxing Day, again came out of the blocks quickly after the break, with Barkhuizen firing just over from distance before McGeady's equaliser. But the visitors again responded well, as Ben Osborn curled a long-range effort just wide, while at the other end, Smith saved well from Paul Huntington's header. 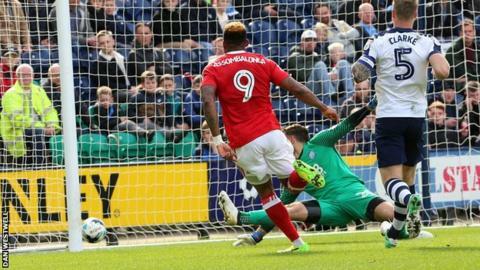 Preston moved up a place to eighth, but slipped six points off the final play-off spot after Fulham's win at Rotherham lifted them to sixth. Forest's second draw under new manager Mark Warburton kept them 20th, just two points above the relegation zone. Preston manager Simon Grayson: "We started the game very brightly with some good opportunities. We just didn't take them when the opportunities came along. "But then you've got to give Forest credit for what a good team they are. They passed it around, caused us a lot of problems, and got the goal which they deserved. "We're disappointed that we've not won the game because obviously that's what we set out to do, but who knows - it could be still a vital point come the end of the season." Nottingham Forest manager Mark Warburton: "It says something for the quality of the squad, they're disappointed to be going away feeling we've dropped two points as opposed to earning a point. "They've got good quality. There's no doubt about the quality within the ranks, there's no doubt about their work ethic and their desire. "It's just a little bit of belief to know how good they can be and I think you saw in that period what they can produce and it's now about getting that on a regular basis." Match ends, Preston North End 1, Nottingham Forest 1. Second Half ends, Preston North End 1, Nottingham Forest 1. Attempt missed. Jamie Ward (Nottingham Forest) right footed shot from outside the box is too high from a direct free kick. Ben Pearson (Preston North End) is shown the yellow card for a bad foul. Matthew Cash (Nottingham Forest) wins a free kick in the attacking half. Daniel Fox (Nottingham Forest) is shown the yellow card for a bad foul. Corner, Nottingham Forest. Conceded by Tom Clarke. Foul by Apostolos Vellios (Nottingham Forest). Delay in match Tom Clarke (Preston North End) because of an injury. Attempt missed. Tom Clarke (Preston North End) header from the centre of the box is high and wide to the left. Assisted by Aiden McGeady following a set piece situation. Greg Cunningham (Preston North End) wins a free kick on the left wing. Substitution, Preston North End. Alan Browne replaces Paul Gallagher. Attempt blocked. Ben Osborn (Nottingham Forest) right footed shot from the left side of the box is blocked. Assisted by Daniel Pinillos. Attempt blocked. Jamie Ward (Nottingham Forest) left footed shot from the right side of the box is blocked. Assisted by Matthew Cash. Attempt saved. Apostolos Vellios (Nottingham Forest) left footed shot from the left side of the box is saved in the top right corner. Assisted by Ben Osborn. Foul by Matthew Cash (Nottingham Forest). Foul by Chris Cohen (Nottingham Forest). Aiden McGeady (Preston North End) wins a free kick in the attacking half. Substitution, Nottingham Forest. Apostolos Vellios replaces Britt Assombalonga. Substitution, Nottingham Forest. Matthew Cash replaces Zach Clough. Attempt saved. Paul Huntington (Preston North End) header from the centre of the box is saved in the centre of the goal. Assisted by Paul Gallagher. Daniel Pinillos (Nottingham Forest) is shown the yellow card for a bad foul. Foul by Daniel Pinillos (Nottingham Forest). Attempt saved. Callum Robinson (Preston North End) right footed shot from the centre of the box is saved in the centre of the goal. Assisted by Paul Gallagher. Paul Huntington (Preston North End) wins a free kick in the defensive half. Attempt missed. Britt Assombalonga (Nottingham Forest) right footed shot from outside the box is too high from a direct free kick. Foul by Greg Cunningham (Preston North End). Offside, Nottingham Forest. Daniel Pinillos tries a through ball, but Britt Assombalonga is caught offside. Substitution, Nottingham Forest. Jamie Ward replaces Ben Brereton. Attempt missed. Ben Osborn (Nottingham Forest) left footed shot from outside the box is close, but misses to the left. Assisted by Chris Cohen.